Pawpaw | Infonet Biovision Home. Originally from southern Mexico, particularly Chiapas and Veracruz, Central America and northern South America, the papaya is now cultivated in most tropical countries, such as Brazil, Bangladesh, Pakistan, India, Indonesia, South Africa, Sri Lanka, Vietnam, Philippines and Jamaica. 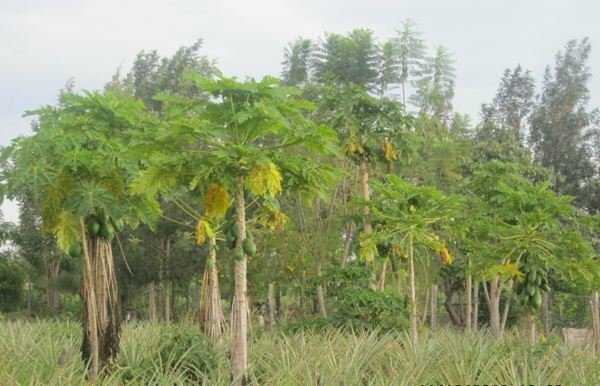 Soil type: A well-drained, permeable, well aerated, root-knot nematode free, fertile loamy soil, preferably rich in organic matter with neutral reaction (pH 6 - 7) is ideal for papaya growth. In cultivation, it grows rapidly, fruiting within 3 years. Weeds must be controlled, especially during the initial stages of establishment. Herbicides, hand weeding, mulching and use of cover crops are some of the practical methods used in the control of weeds. Even though fairly resistant to drought, C. papaya requires a constant water supply. C. papaya is very responsive to fertilizers, and yield can be significantly improved by proper fertilization. Control of pH is also very important. Fruit production begins within a year of planting and is continuous thereafter. C. papaya produces 30-150 fruits/year. As the fruit is formed in the leaf axils, plants must be kept growing continuously for maximum yield. Mature trees may be rejuvenated by cutting back to 30 cm above the ground. The latex should be tapped at least once a week. Fibre; the stem and bark are also used in rope production. Medicine; in some parts of the world papaya leaves are made into tea as a preventative for malaria, though there is no real scientific evidence for the effectiveness of this treatment. Papaya is marketed in tablet form to remedy digestive problems. Meat tenderizer; green papaya fruit and the tree's latex are both rich in an enzyme called papain, a protease which is useful in tenderizing meat and other proteins. This makes to be included as a component in powdered meat tenderizers. Soil improver; the tree when cut rots in the farm adding manure to the soil. Papaya fruits are susceptible to Fruit Fly attacks it lays its eggs in young fruits. In the 1990s, the papaya ringspot virus threatened to wipe out Hawaii's papaya industry completely. This led to introduction of two varieties of papaya, SunUp and Rainbow, which had been genetically modified to be resistant to the virus. Consequently, by 2004 non-genetically modified and organic papayas throughout Hawaii had experienced hybridization with the genetically modified varieties. To date, there is still no conventional or organic method of controlling the ringspot virus. Birnie A. 1997. What tree is that? A beginne's guide to 40 trees in Kenya. Jacaranda designs Ltd.